The	Hunter	Trebles	is	the	junior	choir	of	the	Hunter	Singers	organisation,	celebrating	27	years	of	music	making. 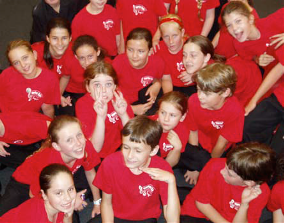 Young	singers	in	the	Hunter	Trebles	participate	in	weekly	rehearsals	at	Merewether	High	School,	learning	songs	and	singing	technique,	music	theory,	playing	games	and	having	fun	making	music. The	Hunter	Trebles	are	conducted	by	music	teacher	and	Star	Struck	choir	director,	Charissa	Ferguson. The	Trebles	perform	in	concert	with	the	Hunter	Singers	once	a	term,	plus	additional	performances	at	the	Sydney	Opera	House	Festival	of	Choral	Music,	Star	Struck,	and	King	Edward	Park	Carols	by	Candlelight. Membership	is	open	by	audition	for	students	in	years	3-6	at	Government	primary	schools. The	Hunter	Trebles	rehearse	on	Tuesday	afternoons	at	Merewether	High	School	between	5.00pm	and	6.30pm. Membership	costs	are	subsidised	by	the	Department	of	Education	and	fees	are	$95	per	term,	with	a	uniform	cost	of	$90,	which	includes	performance	T	Shirts,	and	performance	pants. Students	who	would	like	to	audition	for	Hunter	Trebles	are	invited	to	come	to	a	rehearsal	and	join	in	with	the	group. There	will	be	a	brief,	informal	audition	at	the	end	of	the	rehearsal	in	which	students	will	sing	Advance	Australia	Fair	as	part	of	a	small	group.